As any 4 year-old, A has been quite interested in dinosaurs for some time now. We’ve taken him to the museum a couple of times and about a month ago he was taken on a school trip to the museum where he enjoyed looking at the real size T-Rex once again. 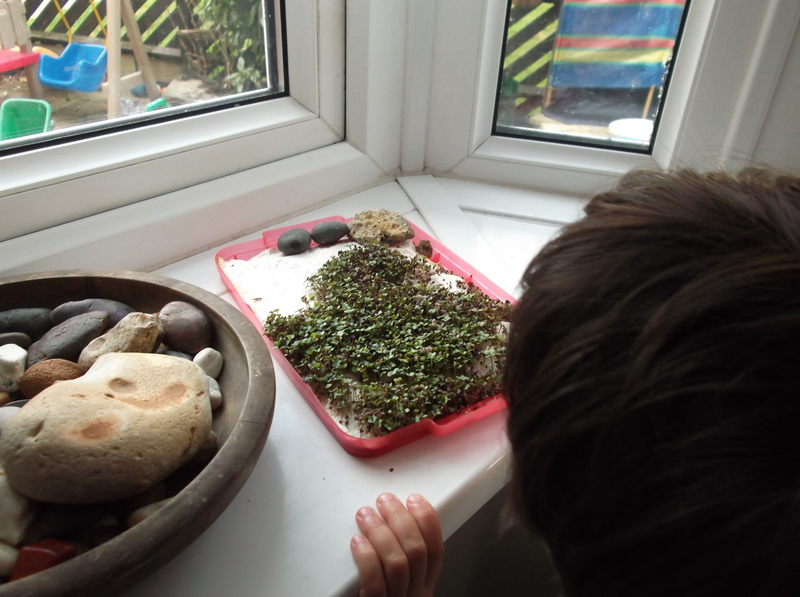 He’s been making several crafts and activities inspired by dinosaurs and A thought it would be fun to make something else at home. 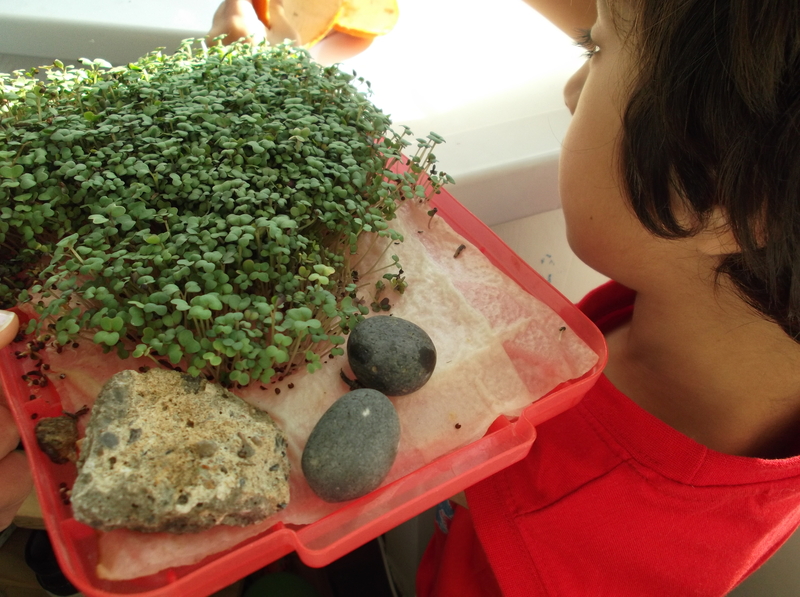 We “including the children” love growing sprouts for our culinary sessions and so we have tried sprouting our favourite alfalfa seeds, mung beans, chickpeas, black-eyed beans, etc. 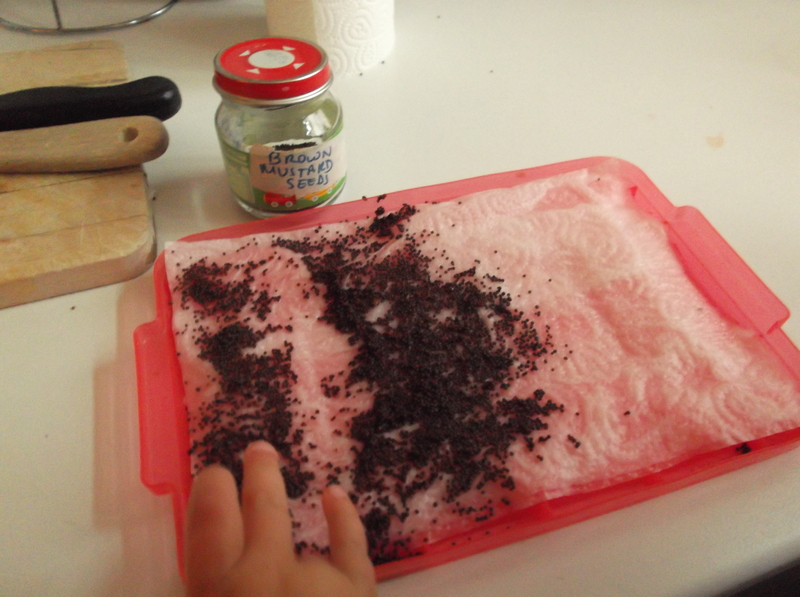 There are some good crafts which children can help with using seeds, like the usual grass heads and any other way in which they can appreciate the time that these little gems take to grow into something edible, something pretty to look at or, like in W’s playgroup, something you can actually use with your toy animals (a grass tray) or in this case a “forest/garden” for his toy dinosaurs. 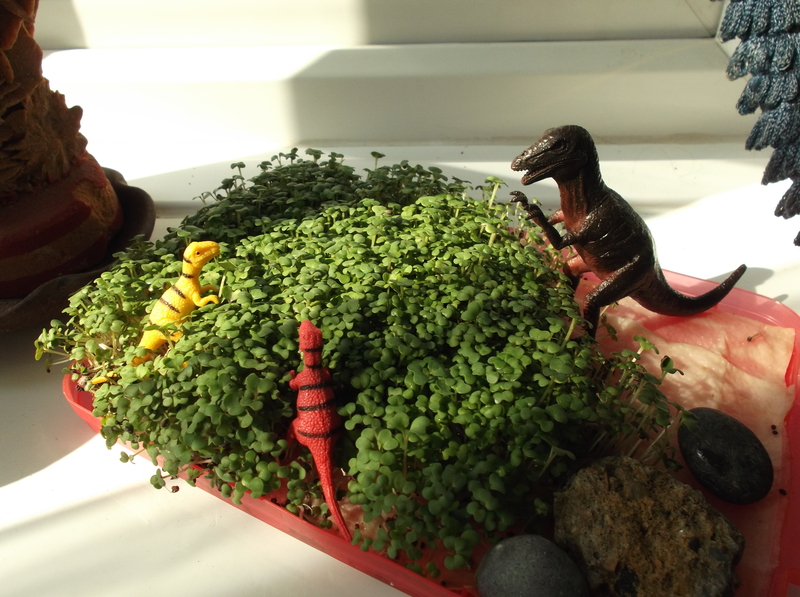 Just as A was looking for some inspiration in The Gardening Book, he came across a mini garden for dinosaurs and here is the achieved result. 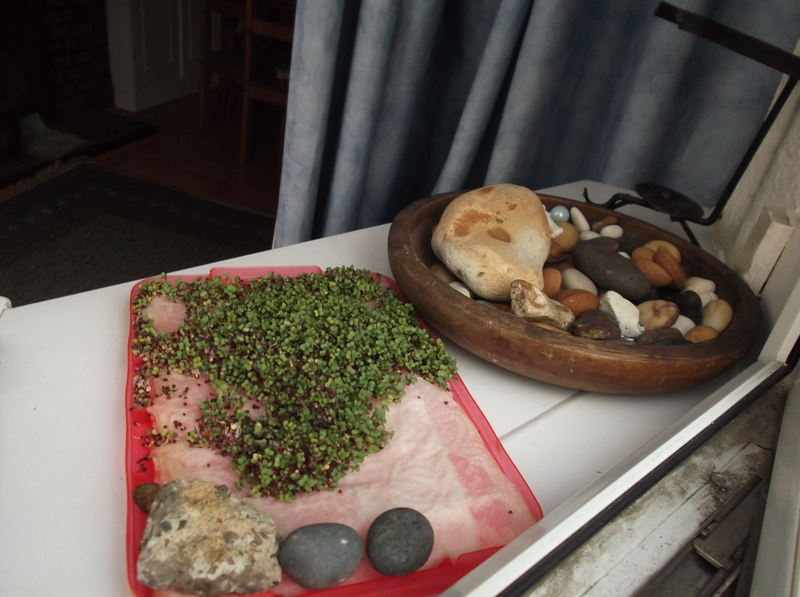 Grab your tray; lay a couple of kitchen paper towels on it; spread the seeds where you want the “forest” to grow and arrange the rocks where desired (you may leave the rocks for later on when the sprouts have grown) and water the tray with enough water so that all the seeds get access to the dampness. Keep in a dark place for 1 or 2 days or until you see the little seeds starting to sprout. Keep moist at all times. keep spraying and watch them grow until you can take out the toys and enjoy your mini-garden/forest. 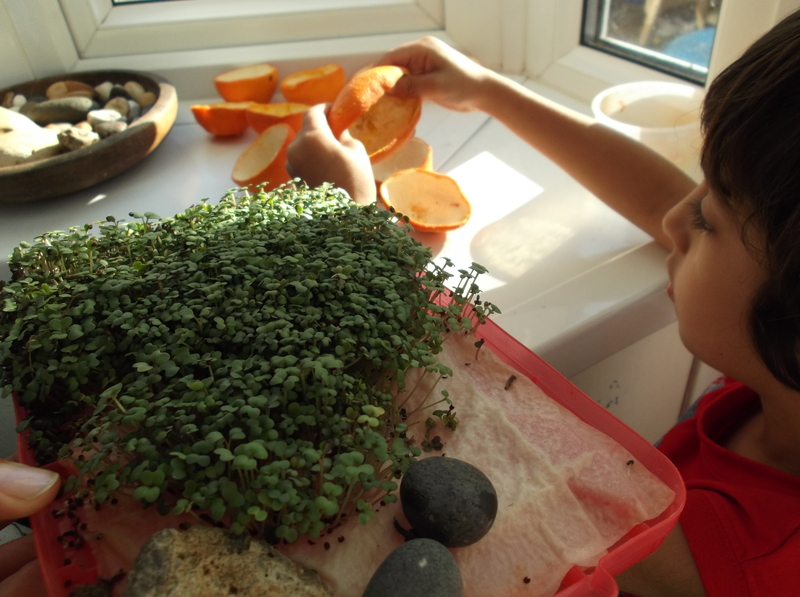 Be aware, you may not reach this stage as your sprouts might look so yummy that you will prefer to munch on them. 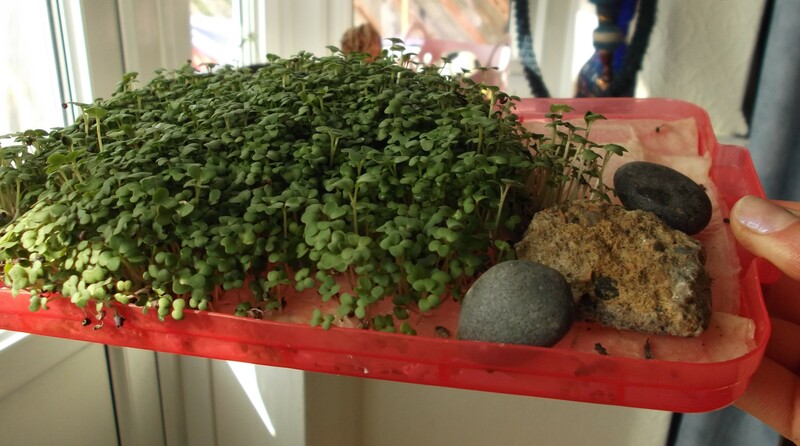 This entry was posted in Of Recipes and Edibles, Tutorials and tagged dinosaur, dinosaurios, germinados, mini-garden, mini-jardin, sprouting by Bodymindsoulparenting. Bookmark the permalink.